2.Click to select the check box of each item that you would like to add to the current view, or click to clear the check boxes of items that you do not want. (Image-1) Change Column Settings in Q-Dir! Available Column Settings: Owner , Name , Size Type ,Date Modified , Status , Attributes , Author , Title , Subject , Category , Pages , Comments , Copyright , Date Created , Date Accessed , Attributes , Artist , Album Title , Year , Track Number , Genre , Duration , Bit Rate , Protected , Camera Model , Date Picture Taken , Dimensions , Company , Description , File Version , Product Name , Product Version ,.... On MS-Vista and Windows 10: over 200 columns ! WOW ;) ! 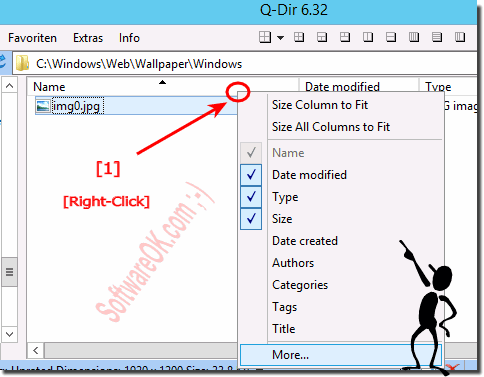 Q-DIR - FAQ-8: How to Change Column Settings in for the Explorer Views in Quad Explorer? I installed Q-Dir and like it a lot. column to show on the other computer.